The St Petersburg Ballet Theatre will grace the stage of Melbourne's grandest theatre, the Princess, for a strictly limited season this June with their world-renowned production of Tchaikovsky’s Swan Lake. Starring prima ballerina Irina Kolesnikova and guest stars from the internationally renowned Bolshoi Ballet, the limited season is Russian classical ballet at its best. 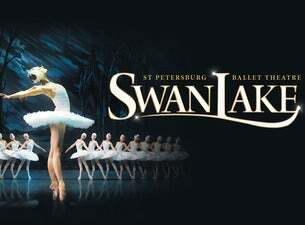 Marking the first time a traditional classical production of Swan Lake has been seen at the Princess Theatre in 65 years, the St Petersburg season is truly a rare and magnificent experience. Following sold out seasons in London and Paris, the St Petersburg Ballet Theatre has been hailed as ‘A TRIUMPH’ (The Times, London) and ‘A COMPANY TO BE TREASURED’ (Sunday Telegraph, UK). See it this June and remember it forever.